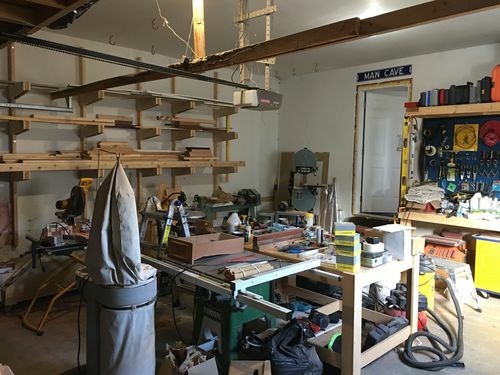 Hey Everyone – I have recently decided that I need a shop upgrade along one wall. I had just a bunch of open shelving which became cluttered and messy all the time. 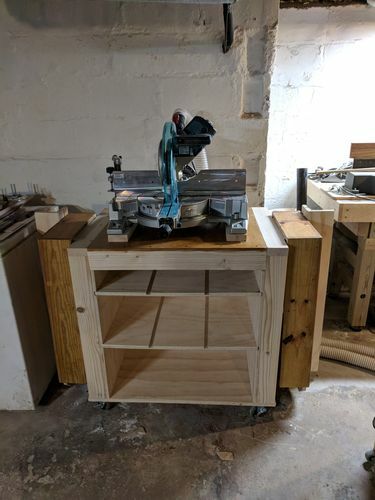 I want to build myself a mitre saw station, with cabinets/shelves/drawers in the base and tool storage and cabinets above. I want to incorporate dust collection as well. My issue is now that I’ve got the wall and space cleared – the original plan doesn’t necessarily fit the space the way I was hoping. I’m looking to see what people’s suggestions are. 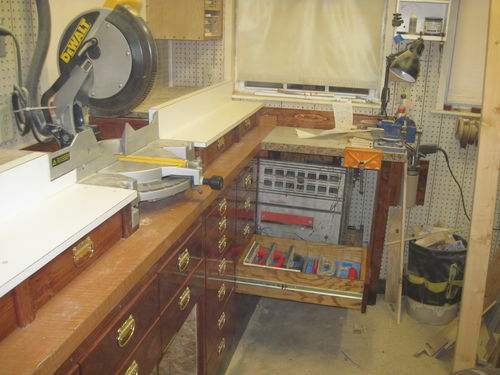 I really like the Jay Bates Mitre saw station as well as the Extreme Mitre station from Kings Fine Woodworking. I run a Dewalt 12” Sliding Compound saw and that’s where the planning issues stem from. 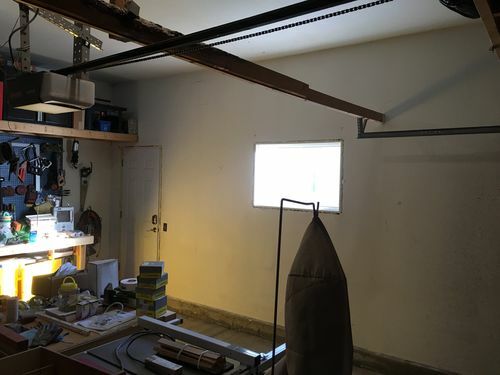 Measurements of the saw mean I need almost 40” of space front to back … but I don’t want to block my garage door or impede the rest of the shop too badly. I thought I’d post some pics and get some feedback from the people who actually have them set up already who can maybe point me in the right direction. And a shot of the rest of the shop for now. Its a major mess, because I had to just move that entire wall worth of storage out of the way to get cleaned up and hit it with paint. From the front of the shop to the back is 21 1/2 feet. 10 1/2 foot ceilings. From the man door to the garage door is 17 Feet. 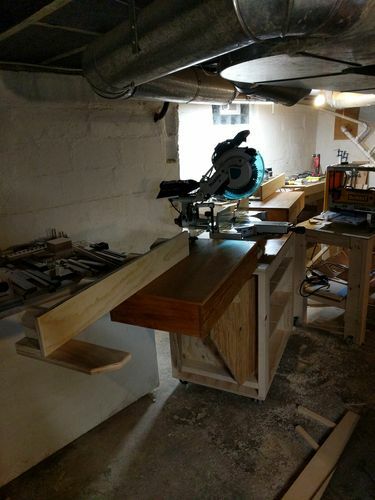 I’m trying to come up with a way to maximize the space, while creating a great mitre saw station at the same time. Any tips, tricks or recommendations would be greatly appreciated. I’m interested in Links or Youtube video’s as well. I’ve watched a ton and from every one I manage to find a new idea I’d like to incorporate into my build. Picture below is mine, built a few years ago. Time on task about 5 months. I mention this because in making something of this size and scope alot of details need to be accounted for. Both before you start and as you go right up to completion. As an example drawers. What size to make? What goes in each drawer and how will you lay them out to get the best use of space. Another detail is dead space. 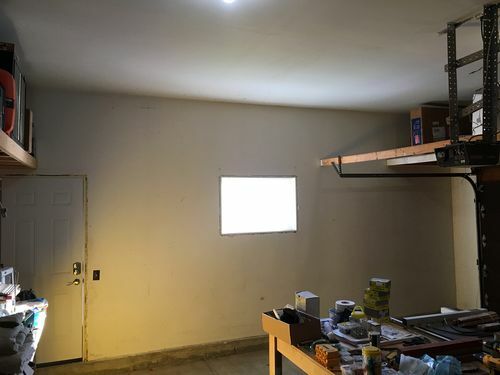 Can it be made into usable space and if so for what? Two difficult questions only you can decide based on need and how you work: mobile or fixed to floor or wall, and second modular or single large build. All have pros and cons, use the search feature to pull up designs LJ’s have made here and take notes. Best advice I have is take your time. Plan well, try Sketchup or old fashioned paper drawings and use them. My current build is a twin table saw cabinet. (side by side) Due to size 43 inches by 68 inches I have to weld up my own mobile base as well as get casters to take the weight and then some. (I tend to overbuild in this regard.) It has 16 drawers of various size based on what tools I decided needed to be in it. As of this evening I am working on the last of the drawer inserts to organize the tools to go in it. Next is top and mobile base then mount the saws and begin that part of the project. Estimated time on project 3-4 months. Thus far I have 7 weeks into it and 37 pages of drawings and notes. 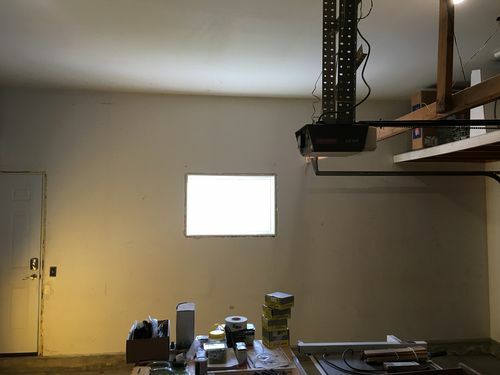 One possible option is to remove a section of the inside wall of your shop and use the added open depth to allow room for your sliding rails. It works best if the studs to each side are spaced equal distance from the side-to-side centerline of your saw. With 2×4 studs, you would gain about four inches. I’ve done this with another tool but not for my miter saw because it is a Bosch GCM12SD, hinged saw. I briefly had a Delta Cruzer and it took up even less space. Thanks Woodbutcher for the detailed response. I Love what you’ve done, it looks great and incredibly functional. I think I do need to slow down a bit and put some more thought into the planning portion. Your timelines provide a more accurate representation of a project of this scope … sometimes I think the Youtube video’s make you think you can tackle anything in a weekend. And Marvin lee, unfortunately I live in Manitoba Canada … my walls are insulated and need to stay that way. Last week it was -45 here and the wall I’m building on is an exterior wall. No problem! I will try to put a drawer together and load it up then post a picture of what I came up with. Finally we have nice weather and I was able to put this monster outside on saw horses and install a few drawer slides. 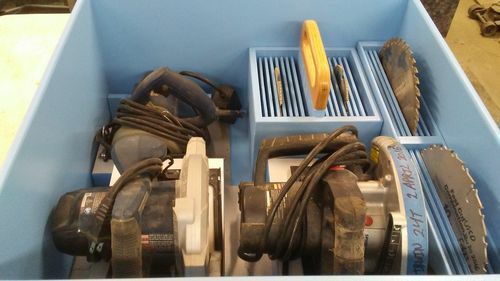 Drawer inserts that hold the following: 2 Skill saws, one 4 inch skill saw, 7 1/4 inch blade caddy, 10 inch blade caddy. Your advice is appreciated, I’ve decided to take a step back and do a bit more planning. I want to layout the tools I intend to store to make sure that my storage has a purpose as opposed to just being thrown together. I mount mine on my workbench. Drill some holes to attach bolts for stability. As for the hang from the miter saw plate I use some n shaped jigs to hold the boards with them being able to fasten down. Cheaper on materials though you have to push around on the workbench. Does make use of sliding the miter saw horizontally on large pieces though. “Hitachi makes a 12 in. sliding miter saw that doesn’t require any rear clearance and it is much cheaper than the Bosch. They also sell a 10” sliding miter saw of similar design that requires even less room. 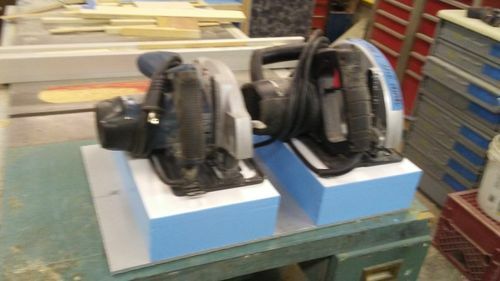 They still use the 2 guide rods but instead of them sliding out the back like the Dewalt, the rods are stationary (attached to the base) and the guide bearings are on the saw. Not sure why they aren’t all made that way? I am kicking myself for not buying it at my local Lowes about a year ago when it was on sale for just under $300. 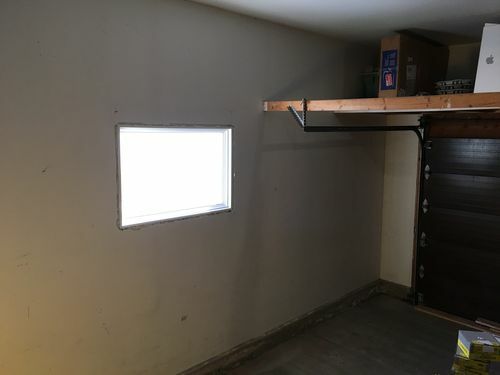 A more radical approach would be to perhaps turn that window into a bay window to give you the room for the Dewalt saw? have you considered a mobile/folding stand? It can be rolled away from the wall while in use, then pushed back to save the space. Maybe less drawer space then your looking for. I’m working on one now. I haven’t completed the drawers yet. Fully extended it’s almost 11ft from end to end. thinking outside the box…maybe you could made the drawers and counter top as planned, but make only the section under the saw rolling? Although if you’re floor is uneven it would be difficult to keep surfaces perfectly aligned. Or mount the saw to a sliding shelf on some heavy duty drawer slides? I agree with what others have posted and you should consider selling your Dewalt one and get a new one that doesn’t require as much room. That’s exactly what I did because the sliding bars were just killing my walking space. Bosch is a great choice and you should look around various websites during sale times and see what everyone offers. I got lucky and got 25% off the Bosch 12” saw, which brought it down to $480 and don’t regret it one bit. After selling my Craftsman saw with stand for $200, I didn’t have to put up too much money for the Bosch. This is just to give you ideas for potentially saving a TON of space when designing and making your station. I’ve been trying to modify my garage storage set for a while, but may just end up making my own and selling the set (for example: Ultimate Garage cabinets). thinking outside the box…maybe you could made the drawers and counter top as planned, but make only the section under the saw rolling? Although if you re floor is uneven it would be difficult to keep surfaces perfectly aligned. Or mount the saw to a sliding shelf on some heavy duty drawer slides? I have this issue of uneven floor as the shop was built by previous owner on what was a well drained patio. He is correct, you can have issues with long boards that are warped. BUT, if you encounter this issue spacer blocks between the two ends resolve it. This saves your stop block system from getting tossed and still leaves a 90 degree angle flat fence ready to go. No need to toss the whole thing. If you have not built a miter station his idea is a good one, it does save space and will mimic a traditional miter station with ease. As always there can be multiple ways to do something, and they all will accomplish the task. Unfortunately right now upgrading the saw is not an option. Mostly because I’ll never be able to sell that idea to the wife. I’ve just upgraded and replaced a few items in the shop and have spent a lot more than I planned over the last little while(not to mention the costs of the mitre station itself haha). 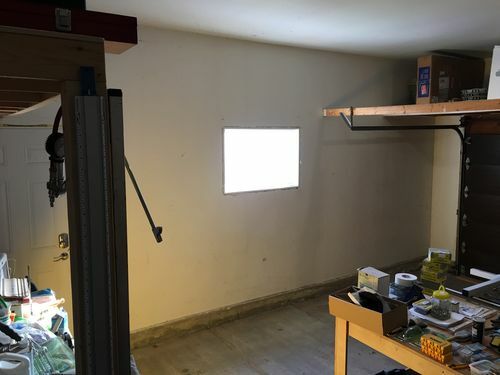 I have started building it in such a way that the saw sticks out – so that when I upgrade to the Bosch or something similar down the road, I’ll gain that space back. For now I’ll have to deal with the inconvenience. As for the mobile idea – storage is 80% of my desire in this situation. 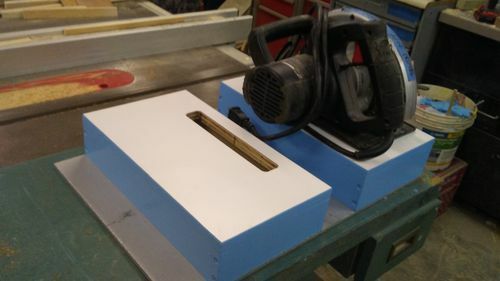 It just also is convenient that it can serve as a nice long surface for my mitre saw, which is probably my most used saw in the shop. Ultimately the decision was made based on the drawers and cabinets I desperately need in my shop for storage. Regarding the idea of a fixed top with rolling cabinets underneath. My shop floor will prevent this from working. My garage floor isn’t a pad, its floating formed concrete like a parkade is made out of. So there is clearly defined ridges/bumps where the forms are joined together.